DEHRADUN, 10 Feb: With the support of United Nations Development Programme, UNESCO Club Doon Valley Central and Waste Warriors Society joined hands, today, with the Nagar Nigam, here, to conduct a Free Health Check-up Camp for all the people working for the environment. It was inaugurated by Mayor Sunil Uniyal ‘Gama’ and Kailash Joshi, Senior Health Officer of the Nagar Nigam. It is often seen that people, who work on keeping the environment clean from day to night, are unable to avail services to protect themselves from the consequences of coming in contact with garbage, such as respiratory, skin and heart diseases, blood disorders, etc. In view of all these problems, all the stakeholders came together to organise this health camp in the municipal auditorium for the first time. Dr Bharat Sabharwal gave a de-toxification counseling session to the patients regarding the harmful effects of tobacco, drugs and alcohol. 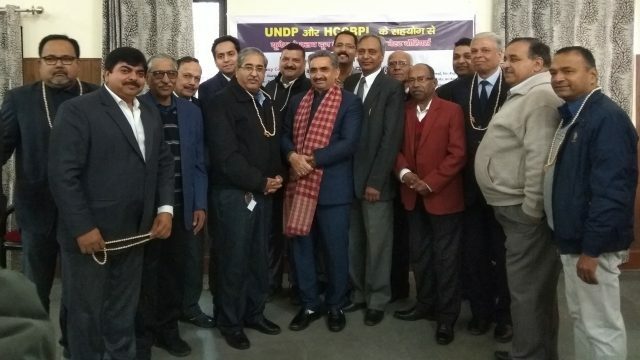 The doctors who participate were Dr Rakesh Mittal, Heart Specialist, Dr Tarun Mittal, Skin Specialist, Dr Devanshu Arora, Eye Specialist, Dr Rajiv Bansal, Dental Surgeon, Dr SK Takkar, General Physician, Dr NL Amoli, General Physician, Dr Vidhusi Jain, Gynaecologist, Dr Arvind Chaudhary, Ayurveda, Dr Bharat Sabharwal, along with pathologists for blood and sugar tests. The programme saw the participation of 290 patients, who underwent check-ups along free medicines over the counter. The medical camp was successfully conducted with the help of Naveen Kumar Sadana, Ankita Chamola and Mithinga from Waste Warriors Society, Dr RK Singh of the Nagar Nigam and Rajiv Arora.